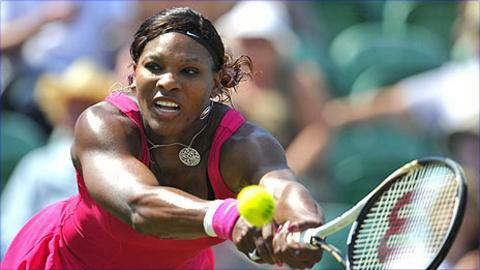 Defending champion Serena Williams has been seeded number seven for this year's Wimbledon Championships. Serena, who returned to action on Tuesday having not played since winning her 13th Grand Slam at Wimbledon last July, is world ranked 26th. Most of the women's seeds moved up a place after second seed Kim Clijsters was ruled out with a foot injury. Britain's Andy Murray is seeded fourth in the men's draw, behind Rafael Nadal, Novak Djokovic and Roger Federer. Serena's older sister Venus, a five-time winner, is seeded 23, despite being ranked 33rd in the world. Serena was originally seeded eighth but her elevation following Clijsters' withdrawal will allow her to avoid playing the highest-ranked players until at least the quarter-finals. The four-time Wimbledon champion stepped on broken glass after her triumph at the All England Club last year, which eventually led to blood clots on her lungs. She returned to competitive tennis on Tuesday at Eastbourne, coming back from a set down to beat Tsvetana Pironkova 1-6 6-3 6-4. "The seeding order follows the WTA ranking list, except where in the opinion of the committee, a change is necessary to produce a balanced draw," explained a Wimbledon spokesperson, speaking before Australian Open champion Clijsters withdrew. "The only changes this year are Serena Williams and Venus Williams moving to eight [now seven] and 24 [now 23], respectively. "This reflects the balance between their proven records and also their lack of competitive play in the past 12 months." World number one Caroline Wozniacki is seeded first, and with Clijsters out, Vera Zvonareva is at two and French Open champion Li Na at three. Another former winner, 2004 champion Maria Sharapova, is now seeded fifth, one behind Victoria Azarenka.